In the main Ambulance Station of the capital of the Republic of Slovenia, Ljubljana, is the most up-to-date dispatch center. 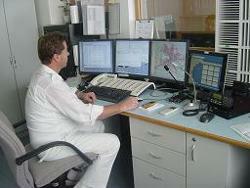 This dispatch center is totally information-based and is a communication hub for all EMS Station further activities. Communication paths are managed by a professional communication server Siemens Hipath and software of the Call Center. All telephone and radio conversations are logged by the Recording system LRProfessional. Radio consoles are being managed by dispatchers by using the NDC-Dicom++ Radio center. The dispatch service manages all interventions by NMP3000dispatch program and follows the urgent teams on GisWebBrowser. The GIS is totally adapted to the EMS service with IMS tools. Emergency vehicles of EMS station Ljubljana are completely equipped with devices for GPS positioning and wireless data transfer with dispatch center from terrain via commercial wireless network. Data connection gives EMS teams on the terrain the chance to communicate with dispatchers and hospital departments automatically by sending and receiving data from EMS protocols. For that kind of documentation they use NMP3000mobile program, which is adapted for field use on tablet PCs of different bidders. 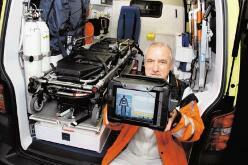 In NMP3000mobile there are implemented protocols for emergency doctors and technicians. Positioning of the Ambulance vehicles is important for the EMS team to navigate on the streets as well as in Dispatch Center where it helps in fast decision making. For the transfer of GPS data NMP3000boxConnector takes care of. It stores the history of rides for a longer period. In that way statistics can be elaborated on the EMS vehicles at any time. NMP3000GISconnector connects data in the NMP3000dispatch program to GIS system of the Ambulance Station Ljubljana, so it can show terrain situation and vehicle locations. In University Clinical Center Ljubljana the non-urgent ambulance vehicles transports are ordered electronically from HIS program in the clinical departments. HIS programs have Ambulance Vehicle Order Form embedded. NMP3000hospitalConnector enables HIS systems of Slovenian hospital and Community Health centers to order non-urgent ambulance vehicles transports to Dispatch system electronically. The staff on clinical departments can then check the state of their order in their HIS system. NMP3000dispatch and NMP3000hospitalConnector are actually doing the work which should be in other case done by call taker in dispatch center. Call taker is in that case free of non-urgent calls and so available for the possible calls of an urgent nature. That kind of communication avoids the double entries in HIS and Dispatch programs. It is also immune on communication noise which occurs in verbal communications. The project of informatization of the Ambulance Station Ljubljana is going on since 2003 and shows some significant improvements in efficiency these days.